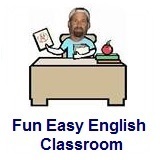 ﻿ Fun Easy English - new classroom free online classes english language lessons speaking listening writing reading may 15. 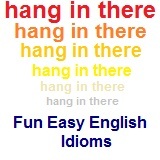 Today in the Fun Easy English classroom you are going to learn some idioms beginning with the letter G.
Today learn idioms beginning with the letter G.
This idiom is used to get someone to look at something. This can also be used to ask someone to get an unspecified quantity of something. Please get a load of soil from the garden. Gordon: The economic news doesn’t look good, does it? Hobart: Not according to the newspaper yesterday. I saw a similar report last night on TV. Gordon: I saw that, too. The analysis seemed to be quite realistic. Hobart: I hope they’re wrong. We really need to get the rising price structure under control. Gordon: Well, costs seem to be rising in so many categories that it appears to defeat any efforts at stabilization. Hobart: That’s my feeling, too. Raw material now costs more. Labor is demanding higher wages and production costs continue to soar. Gordon: There may be some relief this summer. I understand the price of some foodstuffs will decrease.